Welcome VR lovers to the latest instalment of Field of view, the only place to catch up on what's been happening in the wonderful world of virtual reality. This week, we found out about Google's favourite VR apps, see how VR documentaries are going mainstream and get excited about the news that the HTC Vive getting real-time eye tracking. We also picked out our favourite VR music videos, debate whether you should get a mobile headset instead of a PlayStation VR and try out Acer's mixed reality headset. Once you've got through that little lot, we've picked out some of the VR stories you may have missed including Google's new VR cam, a Nintendo Switch VR demo and an Alien VR experience you definitely need to try. 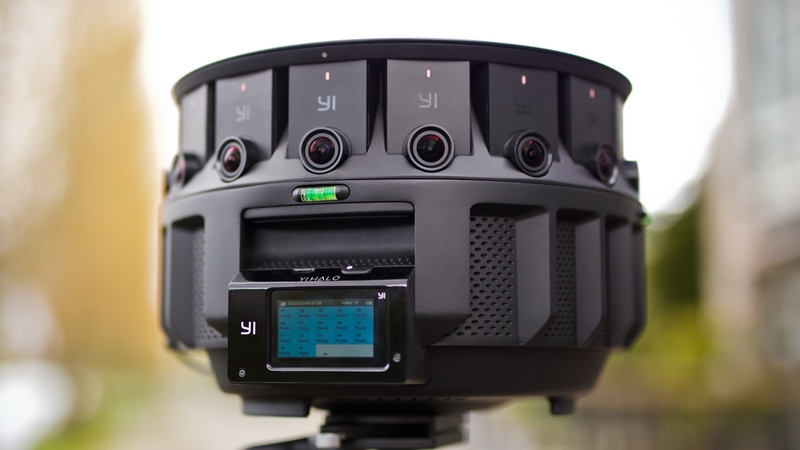 After launching its first high quality VR camera rig in 2015, Google this week unveiled its new setup that aims to make it easier to produce immersive flicks. The Yi Halo features 17 4K cameras to capture footage and has a big enough battery to deliver up to 100 minutes of continuous shooting. If you're interested in getting your hands on one, it's going on sale this summer. Check the video below to see what the next gen Jump camera is capable of. The BBC is bringing VR and radio together for a new online drama called Quake. The BBC Radio 4 production tells the story of a search for survivors after an earthquake. The first of 12 audio episodes will be accompanied by a 360-degree film to help set the scene for the rest of the series. The vid will be available on the Radio 4 YouTube channel with the Quake boxset available from the 15 May. Tilt Brush is one of the best experiences on the HTC Vive and has recently popped up on the Oculus Rift with full Touch controller support. Now the drawing app has just been updated with a host of new features including the ability to upload sketches so that other users can walk around them and even tinker with the creations. Other new features include the ability to adjust environment settings and control lighting. Is VR about to reinvent how we work out? Or is augmented reality enough tech for our future exercise sessions? Nintendo Switch VR talk seemingly won't go away and now clever YouTuber Nintendrew has managed to give us all a taste of how the gaming portable fares as a VR-friendly device. After a grabbing a tablet-friendly headset and recording his own video of The Legend of Zelda: Ocarina of Time 3D, you can see the results in the video above. It's certainly not perfect, but at least there's the potential for VR to work on the Switch. Missing your weekly The Walking Dead fix? Well, VR is going to help fill that void in your life until it returns to our screens. David Alpert, executive producer on The Walking Dead TV series confirmed to Variety that a new VR experience is currently in the works. We don't have any details on how it's going to look, but it's fair to assume there's going to be the the odd zombie or two. To get you in the creeped out mood for the film release of Alien: Convenant, Ridley Scott has been part of the team that helped create a VR experience that pays homage to that chest bursting scene. That's right, you're getting a baby alien's view from birth. The 360-degree video is available for the Oculus Rift and Gear VR now and will land on the Vive, Google Daydream and PlayStation VR on 10 May. Prepare to get seriously tripped out by this 360-degree movie that merges scenes from space and nighttime imagery from Tokyo. Created by Japanese research and development outfit Wowlab, you can enjoy by simply scrolling around the video above, but it's much better when viewed through a VR headset.